I am looking for a portable Record Player Tube based or Solid state Like RCA Hi-Fi or Stereophonic units. Can you guys give me some advice what to buy and which makes and models to consider and from where to buy? I am not keen to spend lots of money on these. RCA, Motorola, Zenith, Philco, Sylvania, etc. all made decent portable/table model record players, both tube and SS. And, these same companies made low end stuff, as well. If you see a record player that has seperate L and R volume controls, it is probably a low end model. If it has only a single tube, it is a low end unit. These low end models use high output crystal cartridges that are not gentle on records. The better units will have a single volume control, a balance control (in the case of stereo), and a tone control. The top end units usually have seperate bass and treble controls. The amplifier will have many tubes and some will even use a power transformer, as opposed to the transformerless series string designs used in cheaper models. The best way to tell what you have is to look at the amp. Sometimes, that's not always possible; so, you have to see what controls you have and make an educated guess. GE made some portables in the "trimline" series that are decent; but, they also made tons of "wildcat" and "mustang" models that were low end. Sylvania made several models in their "exponent" line and the better ones in that series used a Garrard changer fitted with a pickering magnetic cartridge. Then, there are the manually operated classroom record players. Most pre-1980's models will be decent, especially those made by Newcomb. These are well built and sound nice; but, the cartridges are not the most gentle on records. Magnavox made some decent ones too up to about 1971 or so. RCA, Motorola, Zenith, Philco, Sylvania, ........ those made by Newcomb. These are well built and sound nice; but, the cartridges are not the most gentle on records. Yard sales, estate sales, flea markets, thrift stores, and antique radio swap meets are the best places to look. Whatever you buy, don't expect it to work perfectly as found. What you get will likely be 40+ years old and will likely need new capacitors and service on the record changer. Can't talk vintage portable phonos without mentioning the KLH model eleven...in production from 1962 until about 1970. More high fidelity then any other suitcase portable I know of...Pickering cartridge, Garrard changer and acoustic suspension detachable speakers. Despite the small 4 inch driver size, frequency response was amazing - they had the greatest magnet weight to cone size ratio of any small speaker made in the 60s. Also of interest is that it was the Worlds first transistorized portable phonograph ! Since they were in production for some 8 years, they are can be found without too much trouble. Unlike many portables, some of which were bulky and heavy, the KLH was a breeze to travel with. Wasn't that KLH unit also sold under the Singer brand? Oh, and DON'T buy any of this modern "Crosley" or other reporduction knock-off Chinese crap. They sound terrible, are hard on records, and will likely stop working after the third record is played. These things make a '50's child's "one tube wonder" record player look high end. 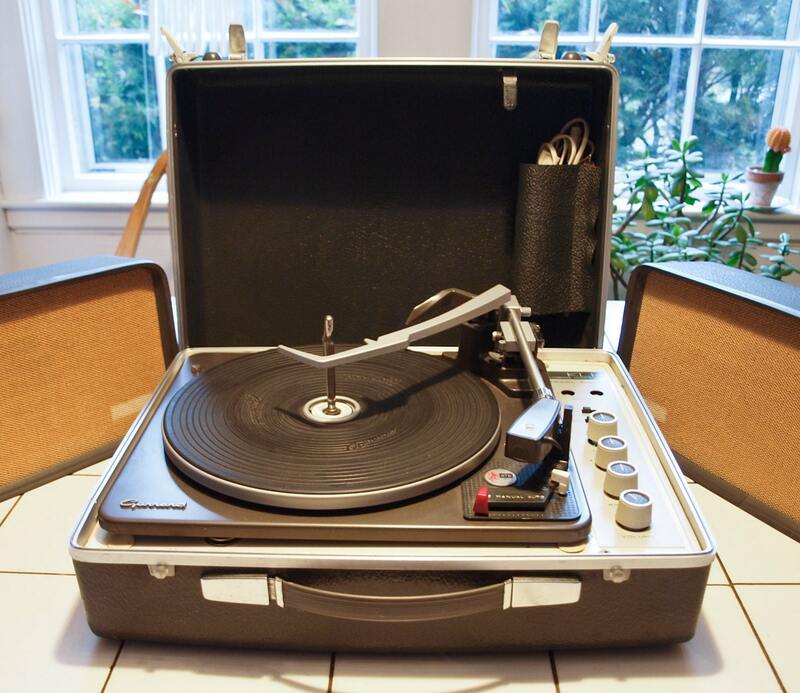 I use an Audiotronics Portable classroom record player that I bought in Texas when a school got rid of them. I have been using it for a long time and has held up through plenty of moves even across the country. Pretty rugged little guy. Nothing glamorous but it works for me. Edited to say....It is manual, it does not have a changer. Good point. A lot of those classroom players had a 6X9 speaker and sounded pretty good. A very few were stereo even. Don't see any reasonably price KLH 11 Players. May be I'll wait for the right one. Are you talking about this model? I love at first sight. I hope I get one like this. Worst part is that I am in Toronto, Canada so shipping will be quite a bit but it will be worth with this player. Yes...the photo above shows a early model eleven with the early tone arm & large head shell (1962-4), and the control knobs were also bigger then later models. They were also sold under the Singer label after 1964 when KLH was bought by Singer Corp. It does take a bit of searching to find a model eleven at a fair price, but they are out there. I wouldn't pay the high $ unless it has had some full service done to it..stylis, caps, idler wheel replacement, etc. Ebay is usually gone to be the most expensive place. Even if you can get the record player for a reasonable price, the added shipping cost will make the cost unreasonable in a hurry. I see lots of record players on ebay that I'd like to have; but, I'm not shelling out $50+ for a project that needs an overhaul. I had the American version of that RCA and it was a decent model. If this one is like mine, it will have a fairly robust power transformer based tube amp in it. Mine had an RCA changer. I see this one uses a Collaro changer. I'd probably get it if it looked nice. What model number is this? And how old this must be? That player is not in the same league as a KLH 11. If you want a high-fidelity phono, wait for a KLH 11 or later system (20, 24), or a similar compact stereo from Fisher or H.H. Scott. That RCA is from the early '60's.